Inherited retinal disease (IRD) is the leading cause of legal blindness in England and Wales among the working age population and the second most common in childhood.1 IRD is a group of clinically heterogeneous conditions, which can result in diagnostic challenges, often thereby necessitating detailed multimodal retinal imaging, as well as electrophysiological and psychophysical evaluation. They are subject to a broad range of research avenues and interventions which have been recently reviewed.2 Here, we categorise IRDs on the basis of natural history (stationary or progressive) and the primarily affected retinal cell type. The incorporation of AO to any ophthalmoscopic technique, including fundus photography, OCT and scanning laser ophthalmoscopy (SLO), provides in vivo microscopic imaging.6–9 AO ophthalmoscopes typically use a wavefront sensor to measure the ocular monochromatic aberrations and a deformable mirror to correct for the detected aberrations.6 9 10 Herein we will be focusing on AOSLO photoreceptor imaging as this is the modality that has been most extensively used in patients with IRD. By focusing a scanning light source on the photoreceptor layer and rejecting out-of-focus light through the use of a confocal aperture, axial sectioning is achieved, thereby increasing image contrast.8 11 Photoreceptors with relatively intact outer segments waveguide some incident light, and backscatter a very small fraction (less than 0.1%), which is used for imaging.12 When collecting that light in a confocal detector, the cone8 13 14 and perifoveal rod8 15 16 mosaics can be resolved. Several systems have been developed including both custom-built and commercially available devices. The selected conditions below have been prioritised based on the ability of published AO ophthalmoscopy studies to demonstrate clinical, research or trial utility. There are inherent limitations due to the often small cohorts reported to date. These are usually small due to the vast genetic and phenotypic heterogeneity of IRDs, the low prevalence of each genotype and due to the difficulty of establishing multicentre studies given the limited availability of AOSLO. However, similar limitations are often faced by other studies using other modes of high-resolution imaging. For clarity, we have included the number of subjects in each study we describe and whether the patients were molecularly confirmed (online supplementary table 1). Duncan et al 39 have reported increased and irregular cone spacing within the foveal schisis characterising X-linked retinoschisis. Interestingly, cone spacing was normal and regular elsewhere. The preserved waveguiding cones at the fovea and eccentric macular regions may indicate increased likelihood of successful rescue with intervention—and could also be helpful in patient selection. This group of disorders has been reviewed in detail previously40 (figure 2). Early investigations with cAOSLO identified ‘dark spaces’ in the cone mosaic, increased cone spacing and/or decreased cone density in patients with achromatopsia (ACHM) 16 18 41 42 (figure 2: 1C and 2C). Marked variability in the cone mosaic has been observed across patients; with no significant difference between the two most common genotypes, CNGA3 and CNGB3 42 43 ; and the rarer GNAT2 genotype associated with the relatively least disrupted photoreceptor mosaic.18 44 Until the advent of SD-AOSLO, it was unknown if these ‘dark spaces’ harboured non-waveguiding cones or indicated loss of cones—with the presence or absence of cones being directly related to potential rescue with intervention. Simultaneous cAOSLO and SD-AOSLO have allowed the identification of cone inner segment structure in these spaces,17 24 25 45 with transformational implications on our understanding of ACHM and participant selection for ongoing CNGA3-ACHM and CNGB3-ACHM gene therapy trials (figure 2: 1D and 2D). Given the potential disconnect between OCT and AO measures of cone integrity and the ability of AO to directly visualise the target cones for gene replacement, non-confocal SD-AOSLO imaging would be the modality of choice to identify patients most likely to benefit from cone-directed rescue. In the largest AO ophthalmoscopy ACHM study to date (n=52), significantly decreased peak foveal cone densities and increased spacing, using SD-AOSLO in CNGB3-ACHM has been reported.45 Interestingly, the peak foveal density ranges were shown to overlap between the previously described OCT grades,43 in keeping with the aforementioned disconnect. Overall, these AOSLO imaging studies have identified significant intersubject variability in cone mosaic integrity and illustrate the importance of cellular imaging in the identification of remnant cones that have the potential to be rescued in planned interventions. The cone photoreceptor mosaic in three patients with typical oligocone trichromacy has been investigated, and in keeping with the original disease mechanism hypothesis, a decreased number (‘oligocone’) of otherwise normal appearing foveal cones (thereby permitting ‘trichromacy’) were observed, with absence of visible structure beyond the central fovea.51 RGS9/R9AP-associated retinopathy is clinically indistinguishable from oligocone trichromacy, but can be discerned using non-standard extended electrophysiological assessment or molecular genetic testing. 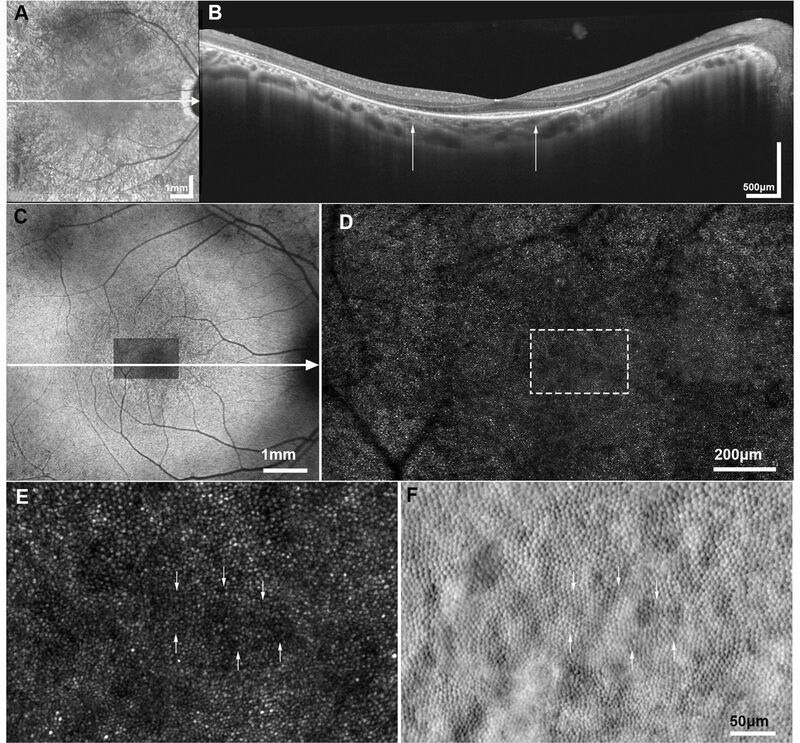 However, unlike in oligocone trichromacy, cAOSLO has revealed a normal cone photoreceptor mosaic in subjects with RGS9/R9AP retinopathy,51 52 which is in agreement with the electroretinography (ERG) findings of normal initial response in dark-adapted flicker ERGs performed with a dim stimulus.53 Cellular phenotyping is therefore able to readily differentiate between these two conditions with common clinical features—with an intact photoreceptor mosaic in bradyopsia and disruption in oligocone trichromacy. Similar to BCM, Bornholm eye disease (BED) is an X-linked cone dysfunction syndrome that is associated with mutations in the L/M gene array.54–58 Predominantly due to the heterogeneity in the underlying genotype (predominantly L/M interchange haplotypes), the degree of photoreceptor mosaic disruption in affected men is highly variable, with cone density ranging from near normal to more than 75% reduction59 (figure 2: 4C and 4D). However, there is also high variability in the appearance of the cone mosaic within brothers who share the same genotype, likely owing to variations in L:M cone ratio.59 60 Cone density has been found to correlate with both axial length and the degree of myopia60; however, systematic analysis of the relationship between these factors and the specific underlying L/M opsin variant is lacking, due to small numbers of subjects within each genotype group to date. Additionally, previous investigations employing AOSLO imaging have been cross-sectional, so there is a need for longitudinal studies to track larger genetically confirmed cohorts, both for BED and BCM, to determine natural history and thereby better establish the potential for intervention. In X-linked RPGR-associated retinopathy, there is a phenotypic heterogeneity (both intrafamilial and interfamilial) among affected men.66 Female carriers’ phenotypes can vary widely, ranging from asymptomatic to severely affected (although not to the extent of affected men) and almost always present with a radial pattern of increased retinal reflectivity, the so-called tapetal-like reflex.67 The patchy appearance of rods and cones observed both ex vivo and in vivo (mosaicism) is believed to be due to random X-chromosome inactivation. Several studies have reported a decrease in cone density and/or increased cone spacing using cAOSLO in patients with retinitis pigmentosa (RP), with approximately half of the subjects having an established genetic diagnosis68–73 (figure 3). Sun et al 21 examined both patients with RP and Usher syndrome (USH) (see below) using cAOSLO and SD-AOSLO, and found that foveal cone density was reduced by up to 38% before VA was affected, without any visible findings on OCT (however, increased cone spacing was not identified in isolated RP cases). This was in keeping with a previous study reporting normal VA and retinal sensitivity in patients with up to 62% reduction in peak cone density.73 These studies illustrate the remarkable redundancy in cone populations, the importance of multimodal imaging and the disconnect between retinal structure and function, with major implications for gene therapy, and also stem cell replacement strategies—including the potential need to successfully integrate smaller numbers of cones than previously believed. Multimodal imaging of retinitis pigmentosa. (A) Infrared reflectance (IR) fundus photograph of a subject (MM_0205) with X-linked retinitis pigmentosa associated with RPGR gene. The white arrow represents the section of the optical coherence tomography (OCT) presented in (B). (B) Horizontal transfoveal OCT line scan, with the white arrows indicating the width of the corresponding AOSLO imaged area in (D). (C) Fundus autofluorescence imaging, with the confocal AOSLO (cAOSLO) imaged area (D) superimposed over the foveal avascular zone and the white arrow represents the section presented in the OCT scan (B). (D) cAOSLO imaging revealing a disrupted waveguiding mosaic, not as uniform in appearance as in a healthy subject (figure 1). (E) Magnification of cAOSLO over the estimated foveal centre (marked with a white dashed square in (D)) shows irregularly waveguiding cones, which appear dim (some are indicated with white arrows); and (F) the corresponding split detection AOSLO in exact spatial registration showing relatively healthy-appearing cone inner segments, the white arrows indicate the corresponding inner segments for the irregularly waveguiding cones identified with white arrows in (E). Vincent et al assessed macular morphology in cone dystrophy with supernormal rod responses with cAOSLO and reported decreased cone densities and a disrupted mosaic, with cones in groups, surrounded by patches of absent or non-waveguiding cones.79 It will be of interest to further investigate subjects with SD-AOSLO to probe whether the non-waveguiding cones are indeed absent or whether inner segments are present. Patchy cone loss in symptomatic carriers and a normal photoreceptor mosaic in asymptomatic carriers have been observed.80 Disrupted parafoveal mosaics, with increased cone spacing, were seen in affected men, with more regular spacing near the borders of atrophy.80 In combination with OCT findings, likely simultaneous degeneration of the RPE and photoreceptors was suggested. 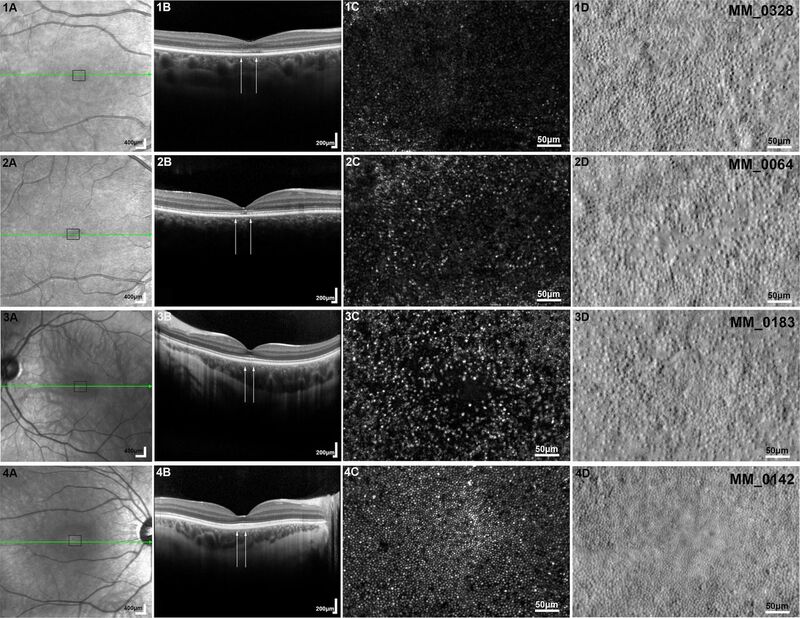 The largest multimodal study to date including the use of cAOSLO81 describes a relatively intact central retina with a normal or reduced cone density at 0.5 mm eccentricity; and an abrupt loss of cones at the border of RPE atrophy, as well as hyper-reflective clumps of cones in younger patients (<30 years) and bubble-like lesions within the choroid; findings also identified by Sun et al.22 No RPE cells were visible in areas of cone loss, with IZ dropout preceding EZ disruption.81 Investigators thereby proposed that choroideremia (CHM) is primarily an RPE disorder followed by photoreceptor degeneration, with implications for intervention and the ongoing debate on cellular pathogenesis of CHM. Only by using non-confocal SD-AOSLO22 has reliable visualisation of cones been possible in the bordering areas of atrophy, with abnormal and heterogeneous morphology, density and diameter. The cone mosaic terminates sharply before those areas, in direct contrast to previously reported RP transition zone imaging, which may relate to the likely primary RPE pathology in CHM. This study also concluded that RPE degeneration precedes photoreceptor loss. IRDs are the most genetically and phenotypically heterogeneous conditions in medicine, with certain genotypes being extremely rare making it challenging to establish large informative cohorts, suggesting the need for multicentre studies. Many of the studies incorporated in our review highlight the need for longitudinal monitoring. Insights into disease progression are of great value including identification of the optimal therapeutic window and participant stratification. One major common limitation is the challenge in imaging patients with nystagmus (eg, ACHM) and/or poor fixation (eg, STGD). Eye tracking systems incorporated into AO systems85–87 can allow imaging of more subjects and improve data acquisition. Moreover, image processing and analysis are substantial bottlenecks that developments in, for example, machine learning, will hopefully solve in the near future, thereby allowing a broader application of AO technology. AO is a rapidly evolving field, which has a place in diagnosis, advice on prognosis, monitoring and management of IRDs. It can also probe underlying pathophysiology and facilitate improved understanding of cellular retinal anatomy and biology. We anticipate an increasing use of AO systems in the future due to the complementary information they provide compared with other imaging modalities and the ability to target functional measurements on individual cells, with particular application in longitudinal natural history studies and ongoing/planned interventional trials both for participant selection and monitoring treatment safety and efficacy. PubMed was searched for articles related to AO and IRDs up to June 2017 with key words: Adaptive Optics, AO, AOSLO, Retinal Imaging individually and in combination with the conditions’ name (eg, Achromatopsia) as well as their abbreviations (eg, ACHM).
. Objective technique for the determination of monochromatic aberrations of the human eye. Journal of the Optical Society of America. A, Optics and image science 1984;1:987–92.
. Supernormal vision and high-resolution retinal imaging through adaptive optics. Journal of the Optical Society of America. A, Optics, image science, and vision 1997;14:2884–92.
. “Assessing cone photoreceptor structure in patients with mutations in the OPN1LW/OPN1MW gene array”. Invest. Ophthalmol. Vis. Sci 2017:E-Abstract 1257.
. X-linked myopia: bornholm eye disease. linkage to DNA markers on the distal part of Xq. Clin Genet 1990;38:281–6.
. Nonsyndromic high myopia in a Chinese family mapped to MYP1: linkage confirmation and phenotypic characterization. Arch ophthalmol 2010;128:1473–9.
. Cone mosaic disruption caused by L/M opsin mutations in bornholm eye disease. Invest Ophthalmol Vis Sci 2011;52:4896–96.
. Species-specific differences in expression of G-protein-coupled receptor kinase (GRK) 7 and GRK1 in mammalian cone photoreceptor cells: implications for cone cell phototransduction. J Neurosci 2001;21:9175–84.
. X-linked recessive retinitis pigmentosa. clinical characteristics of carriers. Arch Ophthalmol 1986;104:1329–35. Contributors MG drafted the manuscript and provided critical revision. MM conceived, supervised and revised the manuscript. AK, EJP, JC and AD provided critical revision of the manuscript. Funding This work was supported by grants from the National Institute for Health Research Biomedical Research Centre at Moorfields Eye Hospital National Health Service Foundation Trust and UCL Institute of Ophthalmology, Fight for Sight (UK), The Macular Society (UK), Moorfields Eye Hospital Special Trustees, Moorfields Eye Charity, Retinitis Pigmentosa Fighting Blindness, The Wellcome Trust (099173/Z/12/Z) and the Foundation Fighting Blindness (USA). Research reported in this publication was supported in part by the National Eye Institute of the National Institutes of Health under award numbers U01 EY025477 and R01 EY017607. The content is solely the responsibility of the authors and does not necessarily represent the official views of the National Institutes of Health.